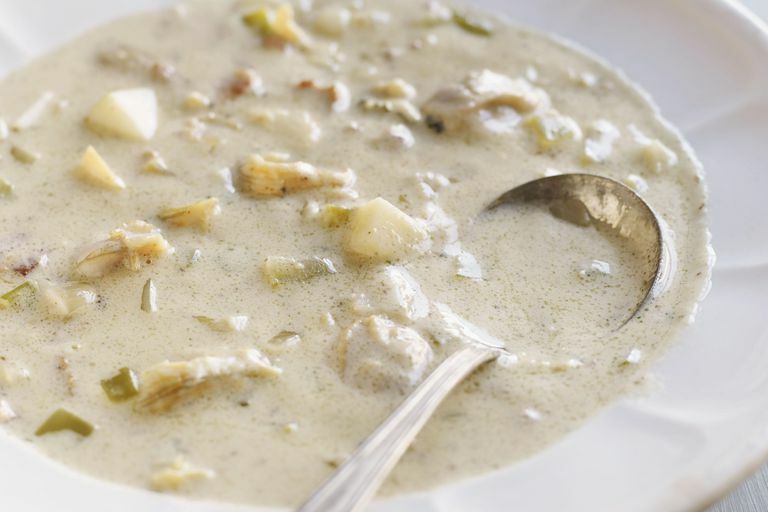 New England clam chowder was introduced by settlers from Europe and became popular in the 1700s. Over time the soup has become thicker and creamier. This recipe maintains the creaminess some have grown to love but is lighter with its use of Greek yogurt and cauliflower instead of cream and potatoes—which also helps it become lower carb than the traditional dish. This soup is also gluten-free for those with celiac disease or digestion issues. If you're using the bacon, chop the bacon into small cubes and cook in the soup pot until crisp. Remove the bacon with a slotted spoon to a paper towel and pour off all but 1 tablespoon of the rendered fat. Fry the onion and celery in the rendered fat until they start to soften. Add the garlic and spices. Stir and cook for about 1 minute. Add the chopped cauliflower and mushrooms and soy milk. Cover and cook for 2 minutes. The mixture should be at a boil. Combine the cornstarch with the bottled clam juice in a bowl and whisk together. Add this mixture to the soup pot. Through a strainer, add clam juice from the canned clams along with the pureed cauliflower and stir. Stop adding the mixture a little before the soup is the way you like it because it will keep thickening as the mixture continues to heat. Turn off the heat ​when the mixture begins to simmer. Add the clams, thyme, and parsley. Heat again until the soup is just at a simmer. Simmer for about 10 to 15 minutes, stirring occasionally every few minutes so that the bottom does not burn. Remove from heat and slowly add the Greek yogurt, stirring. Finish with more celery salt and black pepper if needed. Chowder can be served alone, but garnish and sides complete the dish. Add fresh chives, scallions, or red pepper flakes. Instead of the normal sides like bread, saltines, or oyster crackers, serve this light New England clam chowder with two fresh ears of corn.